In order to deeper understand the meaning of the terms anchor and relay when it comes to captions of images, I read Roland Barthes' 'The Death of an Author' and 'Rhetoric of the Image'. Both articles focus on the meanings that images and texts convey and how they are constructed by its author/photographer and perceived/connoted by the reader/viewer. As well in literature as in images Barthes seems to be finding the process of understanding the meaning and connoting what is read done on the receiver's side. A photographer can set the 'initial anchorage of denoted meanings' (page 159) and underscribe that with a caption that understates this, while on the other hand also trigger its viewer with a relay as a caption, that might bring the viewer into a way of interpreting on its own and building its own rhetoric. The idea of the exercise is to write my own captions to the images. It doesn't say whether it should be related to article itself. Here is an image I took from a newspaper The Hindu of December 10, 2015. Below it you can read the captions that were given by the newspaper. As you can read, it is not directly related to the news item, we don't see a picture of Mr Kumar giving a speech. However, it understates the message in such that it shows images of what you expect when thinking about the Indian pharmaceutical sector, showing two Indian ladies working in a laboratory. The state has to intervene regarding quality, availability, affordability, we can't run away from our duty, says Ananth Kumar, Union Fertilisers Minister. I decided to write captions that are not related to the articles, but purely based on what is shown in the images themselves. 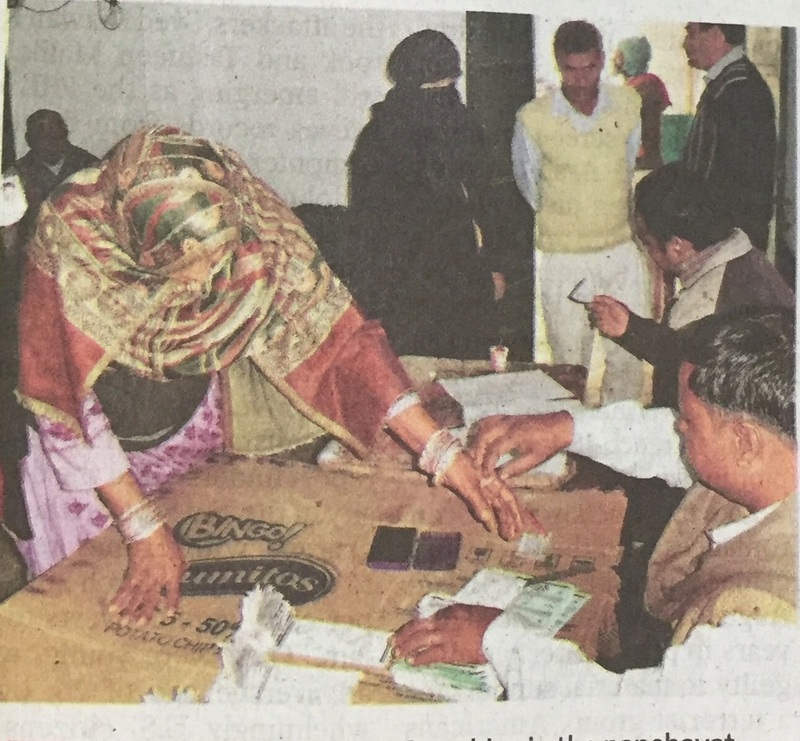 An other image, taken from the same newspaper, is a direct photograph of the news described in the article and shows a lady voting for the first time. A First: Women exercising their franchise in the panchayat election at Masoorpur Mafi village in Sambal district of UtterbPradesh on Wednesday. I notice that with disconnecting the image with the written article, I'm doing exactly what Barthes is describing in his 'Death of the Author'. I deliberately bring a different meaning to the image, leaving only its denoted meaning in place, set by the photographer. I notice that with writing the new captions and disconnecting the image with the news article, I become more aware of the visual clues that are given in the images themselves. What makes me wonder if in this process I come closer to the intentions of the photographer and his rhetoric. In other words, when disconnecting an image from its connotations, do you come closer to its initial meaning, if it had any in the first place? I could come up with many more captions that would direct the meaning of the images in a completely different direction and realise that there is a lot of truth in Barthes' idea that the viewer connotes the image and not the photographer itself. In order to bring back the initial connotation that the photographer has in mind when taking the image, if this is the case, I think the photographer needs to add a caption that describes it. After reading this and thinking about Barthes work, I'm starting to realise that in the process of creating an image with the intention of giving it a certain meaning or bring across a certain message, the intention itself can already be ambiguous. What is it that Margritte is trying to say to the viewers of his paintings? Maybe that what he is showing it not what you think it is, and what you think the object is, might actually be something very different. Because of the caption, the meaning of the object in the image doesn't seem to matter anymore, the point of looking at the painting is to be triggered to ask questions about reality and the connection between seeing and thinking. Barthes, R. (no date) Rethoric of the Image. Available at: http://users.clas.ufl.edu/sdobrin/barthes.pdf (Accessed: 22 January 2016). Homan, C. (2012) Roland Barthes – ‘The death of the Author’ – critical summary. Available at: http://artblog.catherinehoman.com/roland-barthes-the-death-of-the-author-critical-summary/ (Accessed: 18 January 2016).